Breed Bertie Breed! Escape Bertie Escape! Since author P.G. Wodehouse was not very keen to have theatrical adaptations of his short stories and novels made, Jeeves Intervenes, now playing at Taproot Theatre here in Seattle is an almost unique opportunity to experience the delights of Wodehouse’s frivolous characters, expert use of humorous language and spend an evening laughing. P.G. Wodehouse ( 1881-1975) like his near contemporary George Orwell (1903-1950) was a product of an upper-middle class family whose source of income was the colonial service, so he rarely saw his parents, who were always overseas in Asia. Like Orwell, he was shipped off to boarding schools with intermittent internments with various “aunts” who figure largely in the life of his most beloved character, Bertie Wooster. Unlike Orwell, he never got involved in politics and loved his boarding schools, Malvern prep (an elementary boarding school) and Dulwich College ( a middle and high school). His loyalty to his schools and school chums play a big part in Bertie Wooster’s morality. Although he wrote numerous short stories, novels, and contributed to 33 musicals, including Anything Goes by Cole Porter, nowadays he is most famous for the Bertie Wooster & Jeeves stories. Bertie is what the English call an “upper-class twit”, that is to say someone, who has been propped up his whole life by class privilege, so he has a lot of cerebral vacancies, little in the way of survival instincts, but manages to stay on top through the props of his class. In Bertie’s case, time and again, it is Jeeves, his valet/butler/cook/secretary/all around enabler, who gets him out of his scrapes with his aunts, predatory females who craftily engineer reluctant engagements on his part, help his friends retain their allowances from distant uncles, keep Bertie & Co out of jail and minister to their hangovers. Although the plots and the eccentric characters all repeat themselves, the beauty of Wodehouse is all in the use language. And what a use of language it is!!!! Drawing on the centuries old theatrical device of making the servants cleverer than the masters, (and also privy to a lot of underground information) Jeeves is a genius of intrigue, sang-foid, charm, knowledge and witty sophisticated language. Bertie uses the popular slang of the 1920’s younger generation, as well as some creative abbreviations so that the contrast between the two different linguist styles is simply hilarious..
One of the cultural differences between Americans and the English (at least the Southern English, Yorkshire and the North are excluded) is the way the respective nations express humor. The English style of humor is to understate everything. The American style is to overstate everything. Jeeves’ style of humor is to understate everything, make indirect references to the painfully obvious in a reserved manner, use overly complex language, elliptical imagery and indirectly express every so slight contempt for Bertie. Taproot’s Jeeves, played by Chris Ensweiler, captured the very essence of Jeeves in the most perfect performance of Jeeves I have ever seen. He should definitely be flown to the BBC and replace Stephen Fry asap. 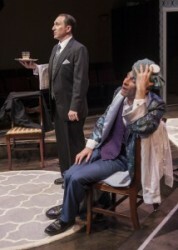 As a play, Jeeves Intervenes follows the standard format. Formidable Aunt Agatha, played by Kim Morris, is trying to arrange a marriage between Bertie and a controlling clone of herself, Gertrude Winklesworth-Pipps, played brilliantly by Melanie Hampton, who supposedly will mold Bertie into something substantial. However, Bertie’s friend Eustace falls madly in love with Gertrude, but due to Bertie’s weak will, Bertie becomes engaged to Gertrude. A subplot is involved when Eustace’s uncle appears and seems to want to cut off Eustace’s allowance, but it is revealed there is some mysterious past between Aunt Agatha and Eustace’s Uncle Rupert. All is chaos, misunderstanding and bedlam, but Jeeves saves the day. In terms of production values, the embrace of modernity, as well as the frivolous spirit of the 1920’s was expressed everywhere, in the Art Deco wallpaper and sliding doors , the white sofa, modern cocktail shakers and especially in the pre-show music by set/sound designer Mark Lund, which set the tone for the cheerfulness of Bertie’s character and his complete detachment from the serious issues of the 1920’s, as well as his own finances. The adaptation by Margaret Raether worked very well. One of the problems with adapting P.G. Wodehouses’s prose is that although the dialogue is brilliantly funny, Bertie’s 1st person narrative is even funnier. Watching this production, I never felt the absence of Wodehouse’s voice, which I have in other adaptations I’ve seen. It is a great feat to take any of Wodehouse’s stories and translate them into theatrical works and Raether’s is one of the best there is. Director Nathan Jeffrey had some incredible creative touches, which captured the true spirit of Jeeves, such as when he appeared almost magically with drinks whenever Bertie even thinks about ringing the servant’s bell. Although I highly recommend this show to anyone lucky enough to be able to beg, borrow, steal, scalp or even buy a ticket, except for Chris Ensweiler as Jeeves and Melanie Hampton as Gertrude, no one seemed to be playing English characters. The physicality of the characters of Aunt Agatha, Uncle Rupert, Bertie and Eustace were too overly expressive for English people of any era, even if some of them were the were 1920’’s Bright Young Things. Aunt Agatha gesticulated too much and shouted, which a woman who is not at all insecure about her authority would never do. Aunt Agatha’s forte was that she could strike terror into Bertie with even a telegram. Some of the accents were hit and miss because they missed speaking with English intonation patterns and the requisite vocal placement; however Jeeves’s accent and demeanor were indistinguishable from the real thing. Like Bertie Wooster, who has his head in the sand about the world outside Mayfair, I welcomed the opportunity to sit and laugh for nearly two hours, to listen to witty language and listen to music from the 1920’s, rather than ponder all the serious issues of the day. They had to add extra seats on opening night so beetle off as Bertie would say and purchase the necessary entrance tickets to the aforementioned theatrical event as Jeeves would say. !!!!!!!!!!! !